They can't be saved by just one man. And I'd take away the weight his shoulders had to bear. Because when he fell I was the only one that cared." Wes is Wes. That is all that xe is. Xe is not tall by any means, and looking constantly rail thin despite how often xe eats and tries to rest. Wes is fairly hardy despite xer frail build, and it is not unusual to see xer with a bruise or scrape here or there. Xer has short black hair that looks like it is always messy, and in the rare occasions that xe is able to tame it... well, people kept asking where Wes was and did not quite always believe that this stranger with fine hair and no bruises was really xem. Xer eyes are always black, and xe never saw a reason to think they would be anything but. That's how Wes likes it, to be simple all around, with xer olive skin and dark features. Xe also has some stray freckles dotting xer cheek, and gets a little shy when they're pointed out. Wes likes to wear warm, darker-colored clothes most of the time, having a terrible time keeping any sort of heat to xem except in the summer months. Xe enjoys wearing long skirts when xe can, but most of the time xe is in simple work clothes. Xe walks with a limp in xer right leg, an old injury from xer childhood never really healing right. Wes is someone who always seems to be worn out. Xe constantly feels weighted down by the world around xer, and it shows most of the time. Even when xe tries to present xerself as happy, or even when Wes genuinely feels happy, there's always something that just feels wrong about it. Wes is just bad at being happy, and bad at feeling like xe actually matters in the world. To xer credit, Wes tries very hard to not let xer own negativity spread to other people. No sense in dragging others down. Wes tends to not form lasting attachments to people, afraid of letting people get close. Acquaintances are fine, having people actually consider xer a friend is outright terrifying. At the core, Wes genuinely tries to do the right thing and be a good person. Xe will offer a hand, stay up all night, constantly do things for other people first and take care of xerself second. Wes' social energy levels are low, and xe hates to actually excuse xerself from social gatherings because xe has gotten overwhelmed. Wes is not a fan of loud noises or lots of shouting, and will only really raise xer voice when something is important or xe's really really angry. And xe's fury is incredible, Wes will go from a standstill and straight into a vicious hail of bites and punches if everything is upsetting enough. Things Wes does enjoy are quiet evenings and warm baths, and being tucked into blankets. Wes would never admit that xe wants someone to help take xer burdens and to not have to feel so worn, because that would mean xe was weak. Wes has an aversion to whers, not running in fear of them but spending too much time near one will send xer into a panic and need to flee, and xe knows it's from xe's mother's brown growing up. Wes prefers to avoid them whenever possible. Even from a young age, Wes knew xe was not cut out to be a farmer. Xe was too small and too thin to be useful for anything other than running errands and keeping out of the way. The fear of disappointment was greater than fear of warfare, fear of dragons fighting in the skies or fear that xe'd be stolen away in the middle of the night and be taken off to fight in the Weyrs' wars. Xe had been only 8 turns old when a fall from a runner, intentionally startled by xer mother's wher out of spite. The runner stomped xe's leg on accident, and then Weylsk rushed xem, snapping down on the limb, permanently crippled xe's leg. The break pretty much promised that Wes would be unable to keep working on the farm, or at least stop being useful in xer parent's eyes. Despite how Wes tried to be helpful and useful, xe's efforts were in vain. Weyla and her wher seemed to delight in tormenting xem, from waking Wes up in the middle of the night with loud noises and screams that everything was burning, to the wher snapping at Wes' bad leg whenever xe tried to move at more than a quick hobble. Wes endured the treatment and abuse for years until xe stole away to Ruatha Hold, hoping to either find an opportunity for something more than what had been thrust upon xer by Weyla. To xe's surprise, and internal glee, a dragonrider (or, actually, their dragon) was visiting the hold and seeking out candidates. Wes immediately moved forwards, pushing through the crowd and trying to get the green - Morwaeth - to notice xer. Fortunately, it paid off, and Wes was swept away to Fort Weyr not a day after the new queen transferred in. Wes didn't care if xe didn't impress ever. Anywhere was better than home. Kreith is a giant blue. He's just big all over, no part of him is tiny. He's heavy muscles and giant wings. He's got a strong tail and has no fear of getting hurt at all. 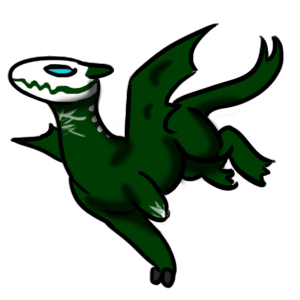 He also has terrible depth perception, being almost blind in his right eye, and sometimes will smack himself in the face with one of his wings. It's never really going to get better, but he doesn't seem to realize this is strange for a dragon. It's normal to him. 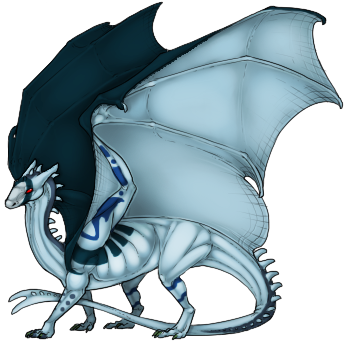 He is a bright pale blue all over, his markings mostly a darker tealy sort of color that covers over his back and wingsails, down his neck and most of his tail. There are thick blocks in the same color over his ribs, and in an inverted 'V' over his face. His face has a lighter sky-gray-blue color. 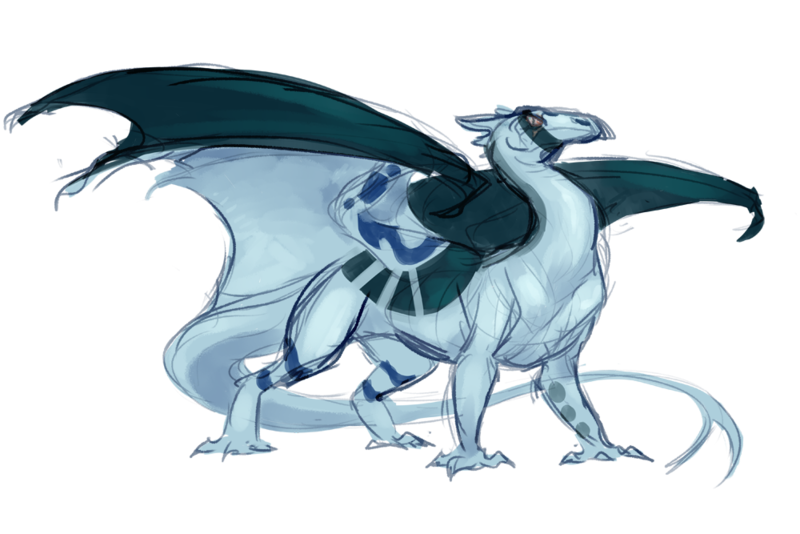 His other markings are a bluer, almost gem color, tracing over his hind legs like boots or straps, and up the arms of his wings in little swishes and runic marks. There are six gray-blue dots over his left foreleg. Kreith is a big rampaging puppy. He has two speeds: 100% charge all the things, and 'oh I'm tired maybe I should stop for a while'. He is rarely the latter. Kreith is very certain that every problem can be solved by him headbutting it, especially with people he does not like. For as quirky as he is, he is a very good judge of character, and he's very protective. Anyone can run to him with a problem, and he will listen. Kreith has no tolerance for people who hurt others, and he will be a roaring rampage of revenge unless someone holds him back, or unless Sireth tells him to hold back. That green is the only one of his siblings he'll ever really listen to, and he would follow her around like a lost puppy if his rider would let him. To his human, Kreith is the ultimate protector. Though he's bad at figuring out what makes humans feel better, he tries and he tries very hard. This blue likes to do things his own way, and he likes to figure out what ways work best for him. He's supportive, but firm. If he thinks his human is going to do something stupid, he will sit on them until they get that idea out of their head. He's afraid of someone he cares about getting hurt. Nothing honestly scares him more. He doesn't want to lose anyone, and he'll throw himself into a patch of Thread to keep people safe. Voice: Kreith has a speech problem. When he is talking just to his human (and sometimes Sireth), he is perfectly fine. However, when he talks to anyone else, his words come out jumbled and rather nonsensical. Saying "How is your day?" to his partner comes out fine, but to anyone else, it will likely come out as "I have the shiniest rock wagon!" When he tries very hard, his words will come out right, but most of the time he is fine with having nonsense speech. A little green that may actually be a bird and not a flit! Maya is a faded green of many shades, and her wingsails look not unlike bird wings. She's got a pale underbelly and a narrow face. Well, a narrow everything. She's twiggy and spindly. Maya is sassy and strong and she knows that Kreith adores her. The giant dragon would move Pern for her, he's absolutely infatuated with her. Maya likes him back, sitting on his head and running to him for safety when faced with larger threats. They're partners, buddies forever, even if they are technically different species. Maya doesn't take any BS from anyone, and she will react with anger and fury if someone messes with Wes. She likes her family and she will end anyone who gets in her way... just don't tell her she's a little firelizard.